Achille Mbembe is one of the most brilliant theorists of postcolonial studies writing today. 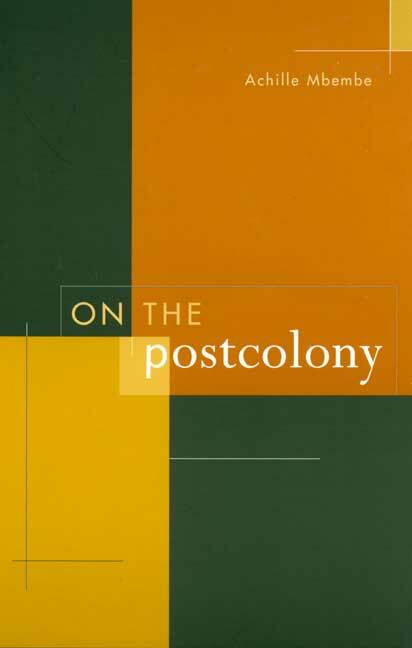 In On the Postcolony he profoundly renews our understanding of power and subjectivity in Africa. In a series of provocative essays, Mbembe contests diehard Africanist and nativist perspectives as well as some of the key assumptions of postcolonial theory. This thought-provoking and groundbreaking collection of essays—his first book to be published in English—develops and extends debates first ignited by his well-known 1992 article "Provisional Notes on the Postcolony," in which he developed his notion of the "banality of power" in contemporary Africa. Mbembe reinterprets the meanings of death, utopia, and the divine libido as part of the new theoretical perspectives he offers on the constitution of power. He works with the complex registers of bodily subjectivity — violence, wonder, and laughter — to profoundly contest categories of oppression and resistance, autonomy and subjection, and state and civil society that marked the social theory of the late twentieth century. This provocative book will surely attract attention with its signal contribution to the rich interdisciplinary arena of scholarship on colonial and postcolonial discourse, history, anthropology, philosophy, political science, psychoanalysis, and literary criticism. Achille Mbembe lives in Cape Town, South Africa. He is the author of three books published in French, including La naissance du maquis dans le Sud-Cameroun(1920-1960): Histoire des usages de la raison en colonie (1996).